The quantitative stoichiometric relationships governing mass and amount will be studied using the combustion reaction of magnesium metal. Magnesium is reacted with oxygen from the air in a crucible, and the masses before and after the oxidation are measured. The resulting masses are used to calculate the experimental empirical formula of magnesium oxide, which is then compared to the theoretical empirical formula. A crucible and Bunsen burner will be used to heat magnesium metal to burning. A great deal of chemical knowledge has been amassed by using simple combustion experiments conducted with crucibles, burners, and balances. In this experiment, you are using this technique to experimentally determine the empirical formula of magnesium oxide. This lab illustrates (1) the law of conservation of mass and (2) the law of constant composition. The total mass of the products of a reaction must equal the total mass of the reactants. Any portion of a compound will have the same ratio of masses as the elements in the compound. In terms of the number of each type of atom per molecule or per formula unit (the formula). In terms of the mass of each element per mole of compound. In terms of the mass of each element present to the total mass of the compound (mass percent). Balancing the reactions is not necessary because the theoretical reaction product and yield is based on the amount of Mg available to react. The expected product is MgO, so the 1-to-1 mole ratio Mg to O in the product is all that is required. Based on the masses of the solid reactant (Mg) and product (MgxOy), the mass in grams and the amount in moles of Mg and O in the product can be determined. Recall that the conversion factor relating grams to moles is molar mass. In the first case, the ratio of Mg-to-O is close enough to 1-to-1. In the second example, the product is slightly magnesium-rich; the ratio of Mg-to-O is greater than the 1-to-1 expected. A magnesium-poor product would have a ratio of Mg-to-O that is less than the 1-to-1 expected. Open flame will be present. FIRE = BAD. Do not breathe the fumes generated. Once any burner is lit, assume ALL equipment is hot. HOT = OUCH. Do not touch the crucible, lid, triangle, ring, or stand during or after they have been heated. Never place anything hot on a balance. Do not look into the crucible when it is heating. Crucibles are used to heat substances to high temperatures (like those encountered with burning metals) without risk of breakage. However, they are ceramic and can break. Please be careful — if your crucible breaks, please inform your TA and get help with the clean-up and disposal. Please know that it is now chemical waste and must be placed in the solid waste container. Do not touch the crucible with your hands (oils contaminate it and/or you could be severely burned). Do not place a hot crucible on a lab bench (the temperature difference may cause it to break). Use the clay triangle. Practice using the tongs to pick up the lid from the crucible and the crucible from the clay triangle. Practice placing the lid partially over the crucible so that there is a gap of about 0.5 cm (the lid should rest on the crucible edge and two legs of the triangle). Practice placing the crucible with lid on the clay tile (when carrying the crucible, always hold it with tongs and support it with the tile). Your TA will demonstrate. Ask questions as needed. Fire the empty crucible and lid for about 3 minutes to remove water, oils, or other contaminants and to make sure there are no cracks. The bottom of the crucible should glow red-hot for about 20 seconds. Remove the flame and cool the crucible with lid. Record the mass of crucible to ±0.0001 g once it has cooled. Do not handle it with your hands. Obtain about 0.3 g (35 mm) magnesium ribbon (do not handle the ribbon with your hands). Fold the ribbon to fit into the bottom of the crucible. Record the mass of the magnesium ribbon and crucible to ±0.0001 g.
Place the crucible securely on the clay triangle. Set the lid slightly off-center on the crucible to allow air to enter but to prevent the magnesium oxide from escaping. 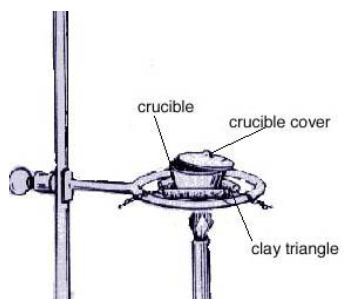 Place the Bunsen burner under the crucible, light it, and brush the bottom of the crucible with the flame for about 1 minute; then, place the burner under the crucible and heat strongly. Heat until all the magnesium turns into gray-white powder (probably around 10 minutes). Stop heating and allow the crucible, lid and contents to cool. Add about 1 ml (~10 drops) of deionized water directly to the solid powder. Carefully waft some of the gas that is generated toward your nose, but be very careful. Record any odor. Also, use tongs to carefully hold a piece of moist pH paper over the crucible. Record your observations. Heat the crucible and contents, with the lid slightly ajar, gently for about 2 minutes and then strongly for about another 5 minutes. Allow the crucible to cool and then record the mass of the crucible and contents to ±0.0001 g.
Follow instructions for oxide disposal given by your TA. Clean all equipment thoroughly and return it. Complete your lab summary or write a report (as instructed). Report the following information. Show sample calculations in a separate section. How does your experimental empirical formula compare to the theoretical empirical formula — do they match? What are primary sources of experimental error? residual Mg(OH)2 in the product affect your results? Does this method appear to be a valid way to determine the formula of metal oxides?